Today on the last possible day of transfers Genoa bougth 20-year old defender: Tommaso Ghinassi of Pistoiese. The player is a great talent that plays for years in the Italian youth-teams. All of this means that our coach trust a lot on the physical conditions of Luciano Figueroa, because he is the only substitute of injured central forward Marco Borriello after the selling of Gasparetto to Chievo Verona today. 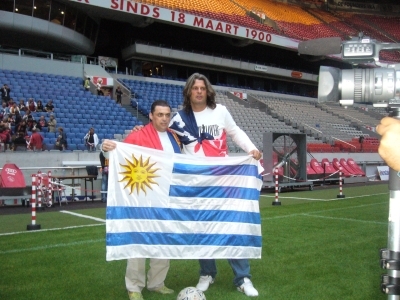 Aguilera and Skuhravy in the Amsterdam Arena. Almost 200 Genoa fans joined thursdaynight a guided tour in the Amsterdam Arena, homestadium of AFC Ajax. After a visit in the Ajax museum and shop , Hans Otten (president GCA) welcomed the fans and suprised them with the highlights of the famous Uefa-game Genoa-Ajax on the megascreen. With a laugh, Hans wanted to skip the last Winter-goal as a sign of friendship. The Genoa fans refused his offer. History is history! Our heroes Pato Aguilera and Tomas Skuravy were also in the Arena and ‘tasted’ the pitch. 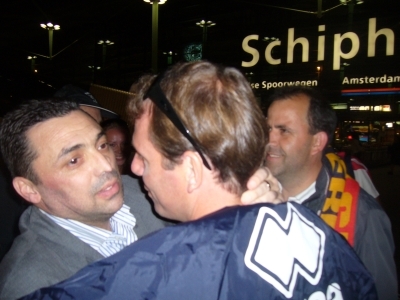 Bello Johnny van ‘t Schip was not in his Ajax-stadium. He was delighted to come, but had to watch a game in his role of trainer of the Dutch national team. This weekend we show you a movie of this wonderfull evening. Keep an eye on the website of Genoa Club Amsterdam! We finished in Volendam to eat some raw fish. Tomas and Carlos, happy reunion! 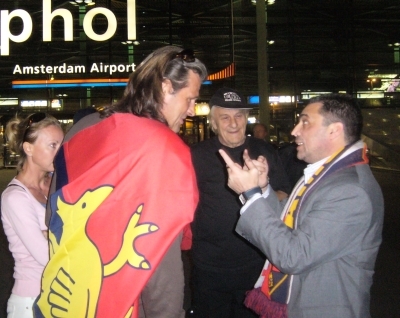 Genoa-hero Carlos ‘Pato’ Aquilera arrived wednesdaynight at Schiphol Airport Amsterdam for the famous ‘Cruise of the red and blue hart’. He and his charming girlfriend were welcomed by Tomas Skuhravy & wife, mister Giuliano, a few die-hard Genoa fans and of course Genoa Club Amsterdam. More news soon! A warm welcome for some all time heroes! The fifth “cruise of the red and blue hart” starts this year in Amsterdam, because 15 years ago the European adventure of Genoa ended in Amsterdam. The big cruiseship MSC Rhapsody leaves the port of IJmuiden (near Amsterdam) at Friday 31st August to visit Dover, St. Malo, La Coruna, Lissabon, Cadice, Barcelona, Marseille and finally to return in Genova on Tuesday 11th September. On board of the ship are many famous Genoani and ex-players like Carlos (Pato) Aguilera, who scored twice against Ajax, and Tomas Skuhravy. Thursday-evening 30th August 200 Genoa-fans and the 2 ex-players visit on invitation of Genoa Club Amsterdam the Amsterdam Arena Stadium for a stadiumtour and a visit of Ajax-museum. Also our member of honour John van ‘t Schip is invited. More news and foto’s in a few days on this site. Before the kick-off the captains of Genoa (Ciccio Bega) and Milan (Ambrosini) gave flowers to the sister of murdered Vincenzo Claudio Spagnolo. After the match Milan-players clapped their hands to thank Genoa-fans. 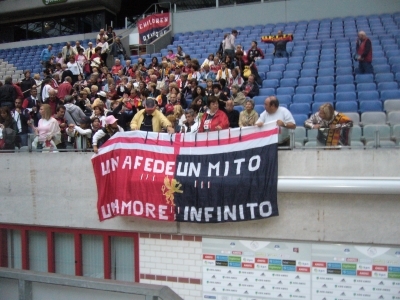 Both clubs hope that in January Genoa-fans can visit the return in San Siro and next year Milan-fans can come to Genova. Let see what the future will bring us. Genoa lost the first match in Serie A against Milan. The team of trainer Ancelotti did not change anything this summer and was simply too strong for Genoa that played offensive as ever. See last match for more details. Today Genoa is back for the first time in Serie A and we play against European champions A.C. Milan. A special match, not only because it is the first one of Genoa after 12 years, but also because it is the first time against Milan after their “supporter” Simone Barbaglia killed Genoa-fan Vincenzo Claudio Spagnolo. For this reason there are no Milan-supporters welcome at Marassi-stadium tomorrow. N.B. Tonight Genoa-forward Adailton did not show up at the medical test by Bologna F.C., the Serie B-team that wants to buy our striker. Both clubs have an agreement about the transfer, but Adailton refuses to leave Genoa. The president of Bologna was not happy with the action of Adailton and decided that he wants to buy another player. Good news for us, because we want to keep Adailton ! !